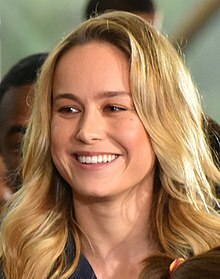 Captain Marvel is a 2019 American superhero film based on the Marvel Comics character Carol Danvers. Produced by Marvel Studios and distributed by Walt Disney Studios Motion Pictures, it is the twenty-first film in the Marvel Cinematic Universe (MCU). Set in 1995, the story follows Danvers' experiences and the re-emergence of her memories as the Earth is caught in the center of a galactic conflict between two alien societies. I keep having these memories. I see flashes... I think I had a life here, but I can't tell if it's real. You are just one victim of the Skrull expansion that has threatened our civilization for centuries. Impostors who silently infiltrate, then take over our planets. Horrors that you remember, and so much that you do not. Nick Fury: ...said the space soldier who's wearing a rubber suit. Lose the flannel. Captain Marvel: [walks up to him and stands over him] I have nothing to prove to you. Keller: You're saying this thing look like Coulson. Nick Fury: Talked like him too. Keller: The woman said there were more. Keller: Do you believe her? Nick Fury:[referring to the dead Skrull on the coroner's table] Not until I saw this. Nick Fury: I'll find Blockbuster girl. I got a call of a motorcycle thief, fits her description. If she can tell me why those lizards are here, maybe she can tell us how to kick them to the curb. Keller. Good. Don't leave her alone though. We can't trust anyone, not even our own men. Mar-Vell: I spent half my life fighting a shameful war. Now get out of here before you give me any more regrets. Just remember the coordinates, okay? You got to save them without me. The Other Accuser : The core? Steve Rogers: This is a nightmare. James "Rhodey" Rhodes: Hey. So that thing just stopped doing whatever the hell it was doing. Natasha Romanoff: What have we got? Bruce Banner: Whatever the signal is sending, it finally crypt off. Steve Rogers: I thought we bypassed the battery. James "Rhodey" Rhodes: We did. It's still plugged in, it just... it just stopped. Steve Rogers: Reboot and send the signal again. Bruce Banner: We don't even know what this is. Natasha Romanoff: Fury did. Just do it, please. You tell me the second you get a signal. I want to know who's on the other end of that thing. Discover what makes a (her)o. Everything begins with a (her)o. This page was last edited on 24 April 2019, at 02:59.